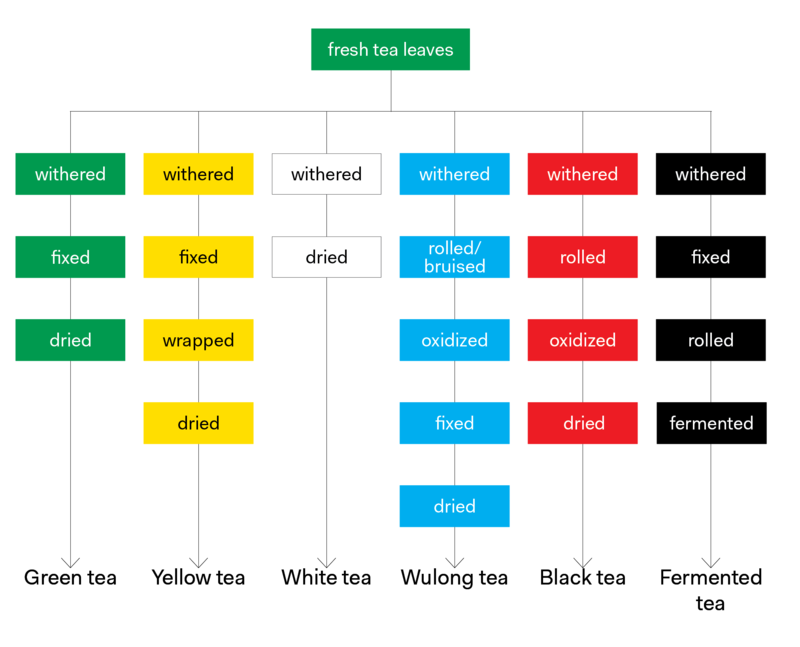 The chart below shows the slightly simplified production of each tea type. They are distinguished by the processing they undergo mainly how much or how little they are oxidised (= enzymatic oxidation, sometimes also called incorrectly fermentation, except for Pu Erh tea). All fresh tea leaves are withered to remove excess water content. Source: Tea Processing Chart by Tony Gebely, licensed under a Creative Commons Attribution-NoDerivs 3.0 Unported License . For green teas the next step is ‘fixing’ (or sometimes called ‘kill-green’) to stop any unwanted oxidisation of the leaves. Fixing is done by heating the leaves to a minimum of 65°/70° Celsius which will kill the enzymes responsible for the oxidisation. Often Chinese green teas are pan fired while in Japan the leaves are treated with hot steam. 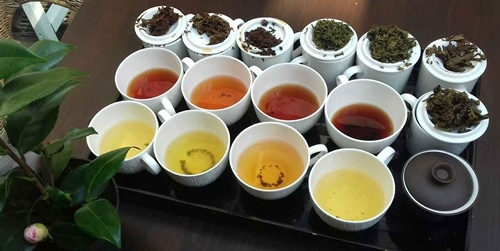 Both methods have a big impact on the final appearance and taste of the produced tea. White tea leaves are the least processed and therefore keep their original appearance. Harvested in spring only the bud and first two leaves are used to produce this light variety. Some oxidisation might occur naturally, which can be seen as brown leaves at the picture of our Pai Mu Tan. Oolong (or Wu-long, means 'black dragon') is a speciality from China and Taiwan. The leaves are bruised and only those bruised edges will oxidise, the core remains green. Once the required grade of oxidisation is reached (10%-90%, semi-oxidised) the leaves are heated to stop this process. The production is labour intense but produces wonderful complex, high quality teas. Black teas are rolled after the withering to break open the cell structure. The released enzymes react with the oxygen in the air, similar to the browning of a cut apple. This is a crucial step and has a significant influence on the quality of the finished tea. To stop oxidisation the leaves are heated where they turn into the name giving black colour. Grading is the last step in the process. This is the so called orthodox production but there is another commercially very important method called CTC. It means Crush-Tear-Curl and is the automated process for lower to medium tea qualities (e.g. tea bags). Orange Pekoe has nothing to do with oranges or orange flavour. It comes from the name of the Dutch royal family: Oranje. Dutch traders were the first to bring tea to Europe and the name for a full tea leave has stuck ever since. Tippy Golden Flowery Orange Pekoe (TGFOP) is the top grade. During harvesting only the bud and the two top leaves and are plucked. These young buds have a golden tip, hence the grade 'Flowery'. When these tips are in abundance the terms 'Tippy and Golden' are also attached. Occasionally the number '1' or '2' may be placed at the end of the letters to designate better grades among similar teas. Similarly the letter 'F' may appear before the TGFOP to designate a 'finer' grade and the letters 'SF' designates a grade of 'super fine.' Thus a tea graded as 'SFTGFOP1' is a ‘Super Fine Tippy Golden Flowery Orange Pekoe - grade 1’. Those grades are only used for black teas. They are just grades and do not necessarily indicate a better or worse quality. 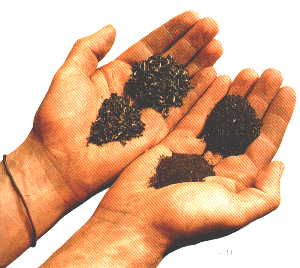 The production of Pu Erh is different to all other teas. After a basic tea is produced (not unlike a green tea), the leaves are piled up and kept moist to initiate a post-fermentation (some oxidisation will occur naturally as well). Then the leaves will be dried but the fermentation will continue at a very slow rate. Therefore Pu Erh is the only tea that has the capability to mature and good qualities will improve with time. Due to this unique procedure Pu Erh also posses unique health benefits (see 'Tea & Health').